Brown is flying back from Ohio for tonight’s vote. 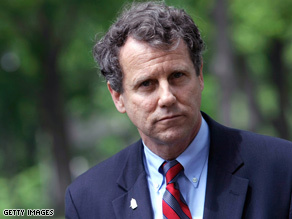 WASHINGTON (CNN) - The Senate will start its vote on whether to approve the economic stimulus bill at 5:30 pm, but the vote will kept open until 10:30 pm because Democratic Sen. Sherrod Brown is home in Ohio attending his mother’s wake, and is not expected to return to the Capitol until late this evening. Democrats need 60 votes to pass the bill, and Brown’s vote is expected to be the 60th. Brown will be flown back to Washington on a government plane. The plane is provided by the White House, Brown’s office said, because the vote is “official business” and there are not commercial flights available that would allow him cast his vote and then return to Ohio for his mother’s funeral Saturday morning. He will fly back to Ohio immediately after he votes. The vote that will start at 5:30 pm is technically a procedural vote to allow stimulus spending to exceed budget rules. But by unanimous consent, senators agreed to have the vote also count as the final passage of the bill, so there will not be a final roll call vote on the bill itself. The official said it is a “small government plane” and the White House decided it was necessary because of the lack of commercial flights this evening, and the difficulty of getting Brown back to Ohio in time for an early burial Saturday morning. It amazes me how many people blogging on this site have such strong opinions and they can't even spell correctly. Just goes to show how educated they are and how much their opinions count. In case anyone cares to take a tally, it's mostly the republican leaning ones that don't know how to spell or structure a sentence properly. The republicans have taken some vital things out of this bill, one being the 10% or up to $15,000 tax credit for homeowners. Instead they brought it down to $8,000 and only for first time home buyers. Until our trustworthy (snicker) politicians realize that until they fix the housing market, the economy will never bounce back. Leaving it at $15,000 and for all home buyers for just one year would have helped the housing market tremendously. The republicans, however, have never done anything to help the average person and they probably never will. Obama supporters, listen up, get ready for 2010. Let us fine out every Republican who is up for re-election and let us go to the poll like we did November 2008, and send those Republicans home for good. All they have been doing is disrespecting our President. He have reach out his hand to them and they have slap it away. They want war. OKAY!!!! Let us get ready for 2010. B-Koi, You are the jerk and I will talk about Obama's spending. Even his own party is "crossing their fingers" and hoping this stupid plan works. Duh, like crossing fingers will help. Nothing like gambling with someone else's money – the taxpayers' money! When Obama stops spending my money (and my children's and grand-children's money) THEN I will stop talking about his spending! Let's not forget the almost 3 trillion spent in Iraq so far. In addition to that, there is a 50M building over there that has never been finished. They have given up working on it. Most tragic though, are the 4000 plus precious US lives (our brave soldiers), and the thousands of Iraqis lost. Our government under President Bush, has spent as much as 16B a month in a foreign country. But Republicans are crying over a Stimulus Package that is barely enough to get US on our knees, let alone on our feet as a nation. You did not show any 'righteous indignation' in October when you got gypped by that 700B for those banks. Where was the outcry of "Spending," "Spending" then? You are such hypocrites. I can't wait to hear your spin six months to a year from now, when the PLAN starts showing positive signs. Mara – to call the war in Iraq futile shows how ignorant you are. Bud Smith – You have a higher opinion of child molesters, no doubt, because you have a low opinion of children. There are too many people like you who are lenient on child molestation, perhaps that's why it is so rampant. The last time I checked, a U.S. sentor still represented his/her constituency. Brown's return to Washington gave voice to the 300,000,000 citizens of Ohio. Isn't this what we elect our senators to do? How admirable of this man to put his state and country first, especially in light of the circumstances. How pathetically small of those who belittled him. How come the Republicans complained and did not offer sensible suggestions towards the Stimulus Package? The Democrats don't have much choice except to try for the 60th vote. The Republicans failed by not being represented in voting for the package. It's outrageous that the GOP made it necessary for Brown to have to fly back to DC to cast his vote only to have to turn around and fly home for his mother's burial. These people have no family value. Come to think of it, they have NO VALUES of any kind. This bill will be #44's tar baby. The Republicans the election is over you ,lost big and the way you are acting in 2010 you will lose even bigger. Please give it a rest the Republicans polices put this country in the ditch and it will be the Dems who get us moving again. I will never vote for a Republican again period! TO ALL OF THE GRIPERS OUT THERE. READ THE BILL AND YOU WILL SEE JUST WHAT THE REPUBLICAN'S ARE AGAINST. THEY ARE AGAINST ANY THING THAT WILL GET US OUT OF THE HOLE THAT THEY HELPED GEORGE BUSH DIG US INTO.THEY ARE AGAINST HEALTH CARE FOR CHILDREN, EDUCATION , JOB CREATION, INFASTRUCTURE, GREEN JOBS, AND EVERY THING ELSE THAT IS IN THIS BILL THAT WILL HELP AMERICA. ALL THEY WANT IS MORE TAX CUTS FOR THE VERY RICH. SOUND S LIKE NICE GUYS DON'T THEY. Does anyone have a picture of the freaking salt marsh harvest mouse that Pelosi is saving with the 30 million in the stimulus package? I would like to hunt the little freak to extinction along with all the liberals that would rather have handouts given to them...the lady asking the Messiah for help in Florida was pathetic and that's a prime example how these liberals are enslaved to the democrats for scraps of the table. The other lady that had her gas tank filled by the Messiah is the other example of another handout...these people expect handouts, they are slaves to the democrats and their social programs. There are 20 states writing their own laws to tell the federal government to go to hell. An eight billion dollar high-speed train to nowhere. On page 215 of part 1, not only will they grant veteran status to non-American citizens, it will pay up to $9K to each a person living in the Philippines that helped us during WWII. Also – they will be given access to VA medical care, therefore taking scarce resources away from our own Veterans. Firstly I’d like to recognize that the transparency and open translations of the Bill’s going through was broken but one has to ask how it could have been posted if it was changing up to the last minute. The other point I’d like to make is the apparent drama the few republicans showed on the bill, the ones who made it on TV claimed they had only hours to read 1000 + pages of the bill in order to properly cast their votes and that was an obvious lie! 90% of the bill had been published and the other 10% compromised to suit the Republican agenda! I wish politicians on both sides would wake up and realize we as Americans are awake! After 8 + years of thinking we had no power in our future and hoping the “Elected” would do the right thing for the American public – those days of blind trust are over! This bill may of been rushed but like everything else in the last couple of decades has been done that way and under the Republican watch we have been bamboozled! While we slept the upper administration fleeced America in a way that should be criminal and treated as such! Once the bill get published the points will be made and the majority of Republicans that didn’t vote for it will be held accountable for their justifications… Prepare yourselves for the attack because the “Sleeping Giant” is wide awake, watching ever step and instantly getting the information that counts! Your days as legislators are numbered, we will not let our Nation or children down no longer. And P.S. the former administration has a lot to answer for and next we’re coming after you for your crimes! CNN is fast becoming the sister channel of FOX News. It is a shame that you can not even truth squad your own reporting. Lou said the HR1 was not available until 11 pm the night before voting. Called President Obama a failure in transperancy. Wrong, everything about the bill has been available for weeks on Thomas.gov where all the bills are posted once they are brought up for action. I have not heard once, CNN compliment this President for requesting everyday Americans opinion on all the government web sites. Like I said CNN, sister cell of FOX News.